A Sean Devine goal in the 52nd minute was enough for Wycombe to register their third away success of the season and re-ignite the promotion push. The goal came after Martin Taylor's long free-kick wasn't dealt with by the home defence and Devine nipped in to slot the ball past Nathan Abbey in the Chesterfield goal. As expected Lawrie Sanchez named an unchanged squad for the trip to Saltergate. Danny Bulman had recovered from the bash on the head he took during Saturday's 2-1 victory over Bristol City and he was in the starting line-up. The only change came with Steve Brown being preferred to Jermaine McSporran who was relegated to the bench. Wanderers started the game in a 4-4-2 formation with Stuart Roberts and Sean Devine attempting to break down a workmanlike Chesterfield defence. In a fairly uneventful first-half Wanderers survived a few early scares before beginning to settle. In the 2nd minute Matrin Taylor saved a curling effort from The Spireites recent signing from Whitby, Jamie Burt. Meanwhile Wycombe's passing game looked good in patches but never really created any clear cut opportunities. A Roberts effort from the left side of the box on 20 minutes saw Abbey pick the ball out with ease, while on the half-hour mark Wanderers forced two corners in quick succession but they came to nothing as Chesterfield cleared at the near post on both occasions. Roger Johnson's far post headed was the closest Wanderers came to breaking the deadlock from Darren Currie's cross. The half finished with a flurry of action. First some good build up by Wycombe three minutes before the break ended with Devine's effort deflected for Wycombe's fourth corner of the half. However, Wycombe lost possession and Jonathan Howard played in Burt before Taylor blocked and Chris Vinnicombe cleared the ball for Chesterfield's first corner of the game. Then right on the stroke of half-time Burt's dipping shot beat Taylor but the crossbar came to Wycombe's rescue before the ball Senda cleared for another corner. Chesterfield started the second-half in similar fashion to how they had the first. Howard whipped an effort wide shortly after the re-start and then on 50 minutes Rob Edwards left foot volley saw Johnson in the right place on the line to keep Taylor's goal intact. Two minutes later Wycombe had opened the scoring in somewaht bizarre fashion. Taylor cleared from a free-kick just outside his own penalty area and as the Chesterfield defence did a bit of ball watching Devine stole in with not the best of contacts to plant the ball in the back of the net from around six yards. It was a simple classic clinical finish from the same player who scored Wycombe's winning goal on the last visit to Saltergate in April 2000. Sanchez replaced Roberts with Andy Baird on 58 minutes and after Hurst had hit an effort straight at Taylor on 68 minutes, Martyn Lee was introduced for Brown. 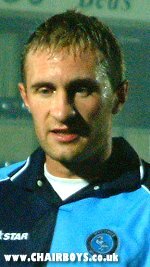 Lee, who made his Football League debut at Saltergate three years ago, almost saw Devine convert from his probing free-kick but it was mainly back to the wall for Wycombe in the closing stages. Marcus Ebdon fired an effort just wide two minutes into stoppage time but Wycombe managed to hang on for three vital points and with 49 points from 31 games, Wycombe now have every chance to push on for a place near the top of the table.